Thank you for your interest in one of Mcphail's Auto Sales's online offerings. 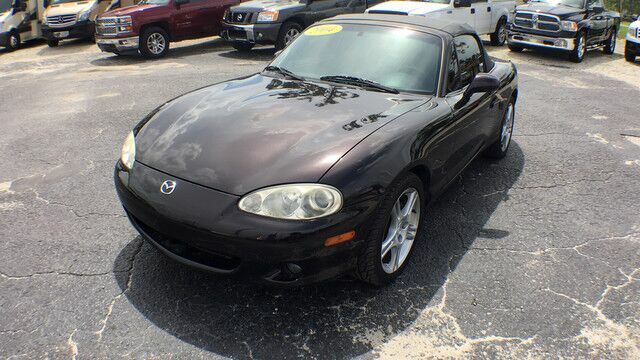 Please continue for more information regarding this 2004 Mazda MX-5 Miata Cloth with 108,437mi. CARFAX BuyBack Guarantee is reassurance that any major issues with this vehicle will show on CARFAX report. The 2004 Mazda MX-5 Miata Cloth Convertible continues to beat the competition in nearly every way. A sporty driving experience that still maintains impressive levels of ride comfort, along with an exceptional, driver-focused interior make the Mazda a recommended pick among convertibles. Low, low mileage coupled with an exacting maintenance program make this vehicle a rare find. With complete records on this pre-owned vehicle, you'll have peace of mind and the satisfaction in knowing your new purchase is safe and reliable. Rare is the vehicle that has been driven so gently and maintained so meticulously as this pre-owned beauty.